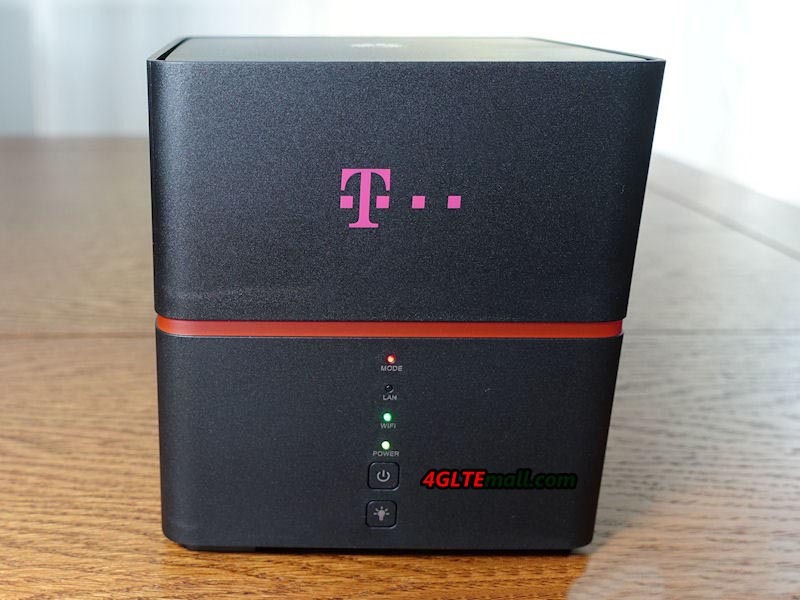 Ther Germany network provider Telekom had added a new LTE router to its contract: the Huawei B529s-23a. Although the Huawei LTE wireless router is visually in the telecom design, the software has hardly been modified. 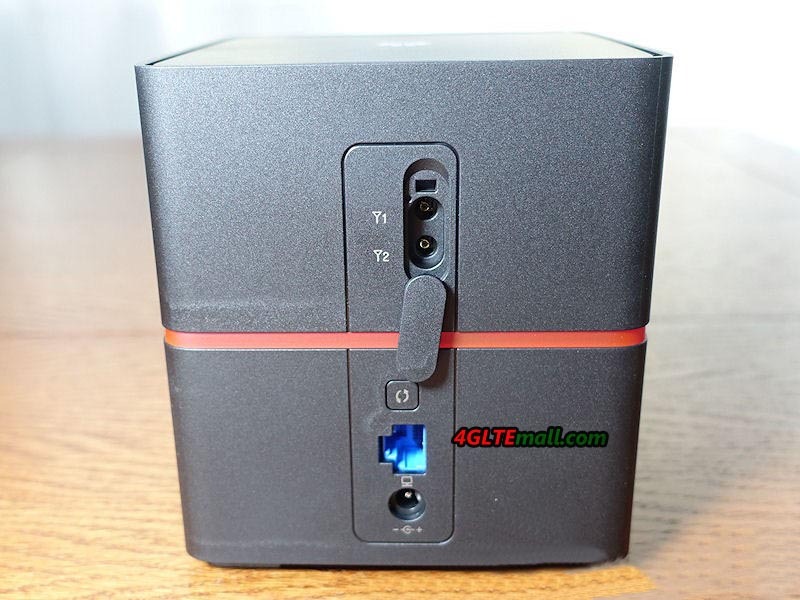 The Huawei B529 is a mix of stationary and mobile LTE router, so it has a “real” power supply and has quite large dimensions, but also has a built-in battery. 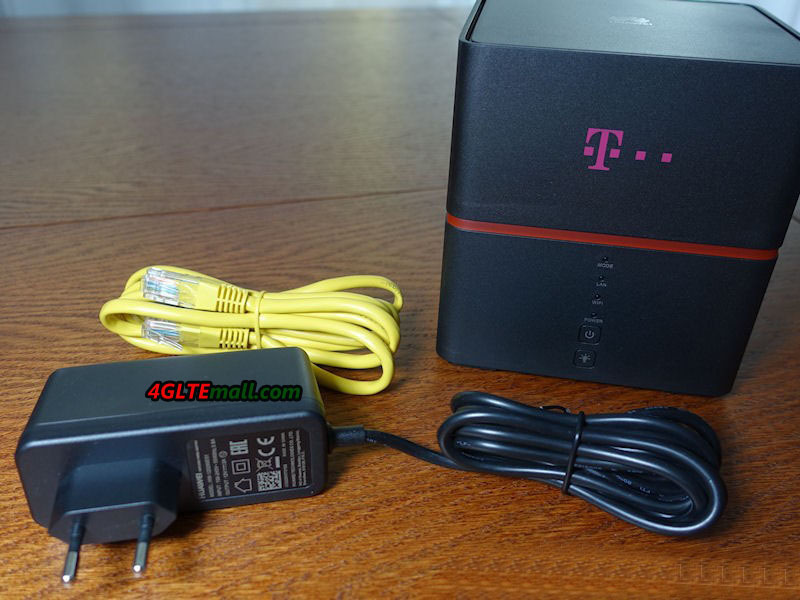 The Huawei B529s-23a is customized for Telekom and got a new named as “Telekom Speedbox” in a smart magenta-colored packaging. 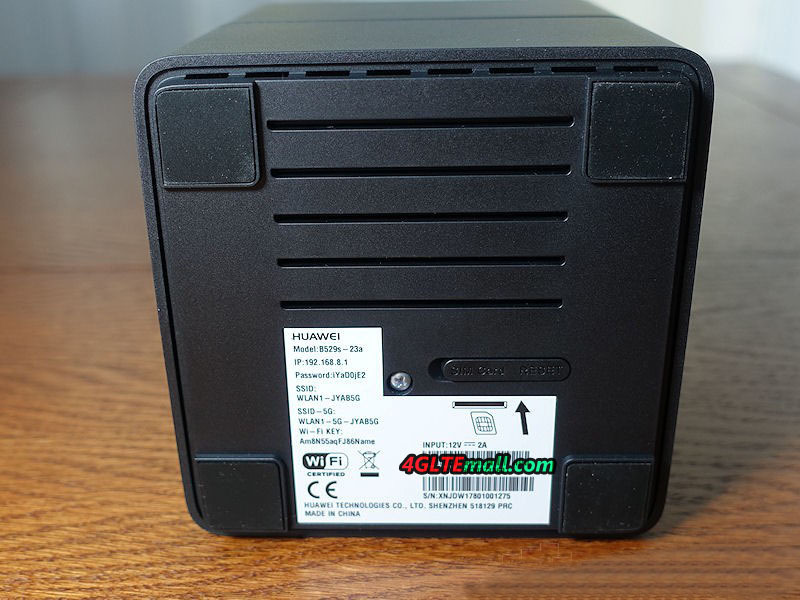 In the package of the Huawei B529 router, there is a power adapter, a short LAN cable and a German-language brief instructions and a “router passport” with the preconfigured WLAN data. The first impression is very good. The Speedbox router is completely made of black plastic and stands on smooth surfaces thanks to four rubber feet safely. With 12 x 12 x 12.7 centimeters, the Huawei B529 is quite compact for a stationary 4G Wireless WiFi router, but quite large for a mobile LTE router. The design especially the going light strip around the router is nice. If desired, the lighting can be deactivated by pressing a button. On the front there are four LEDs, which clearly signal the operating status. There is also a power button and the already mentioned button for the lighting. On the back there is a connection for the power supply (unfortunately no standard USB) and a RJ45 Ethernet LAN connection. Under a cover also two TS-9 connections for an external 4G LTE antenna are hidden. In the test with a Telekom SIM card, the Huawei B529 achieved speeds of up to 150 MBit/s. Although this is far from the advertised up to 300 Mbps, but still a good value. An Huawei Mate 20 and a Netgear Nighthawk M1, each with a much more modern modem, achieved at the same location but each about 20-30 Mbit/s higher speeds. Up to 50 Mbps were achieved in the uplink. The Huawei B529 LTE ​​router also provided good data rates in the O2 network, although latency and speed were always slightly worse than the Netgear Nighthawk M1 used for comparison. While the Huawei B529 on the power supply achieved quite good speeds in the LTE network, an annoying surprise is in the battery operation. The speed drops to about 20 Mbps, no matter how good of the reception. This behavior could be repeatedly, both in the network of Telekom as well as with an O2 SIM card. Whether the throttled battery mode is a deliberate limitation on Huawei’s part or whether it is a bug in the firmware could not be clarified until the end of the test. The integrated battery is not changeable and has a capacity of 3,000 mAh according to Huawei. However, the operating time is quite low at around 1.5 hours compared to a mobile hotspot. The display of the state of charge is in need of improvement, the simple bar display was not helpful in the test, since it had already fallen after 20 minutes on only one bar. The WLAN module of the Huawei B529s-23a transmits to 2.4 GHz and to 5 GHz (WLAN 802.11ac). A maximum of four Wi-Fi names and passwords can be configured in the web interface, two for each frequency range. The speed was up to 780 Mbit/s (gross) in the test. The range was very good in the test, especially in the frequency range around 2.4 GHz. Compared to most mobile LTE routers, the Huawei B529 is clearly better. Up to 64 devices can simultaneously be connected to the Huawei B529 via Wi-Fi, which is significantly more devices than most mobile routers. Unfortunately, Huawei B529 has no wireless extender function. Mobile LTE routers from Huawei can use this function to use an existing WLAN network as Internet access, the B529 can only use the integrated mobile radio modem for this because the LAN connection cannot be used as a WAN port. The Huawei B529 LTE ​​router can be configured either via the browser or via an app. The web interface is provided with a password at the factory, this can be found on the bottom of the router. Compared to previous Huawei router models, this feature has not been changed in the Web interface, the design is functional, but not new and fashion. The variety of functions is limited, after all, the network technology can be set to “only 3G” or “only LTE” and there is a switch for external antennas. The Huawei B529 does not offer the latest technology, but based on the functions, the price is good now comparing with other similar routers. When used as a stationary LTE router, the modem reaches high speeds of more than 150 Mbit/s. 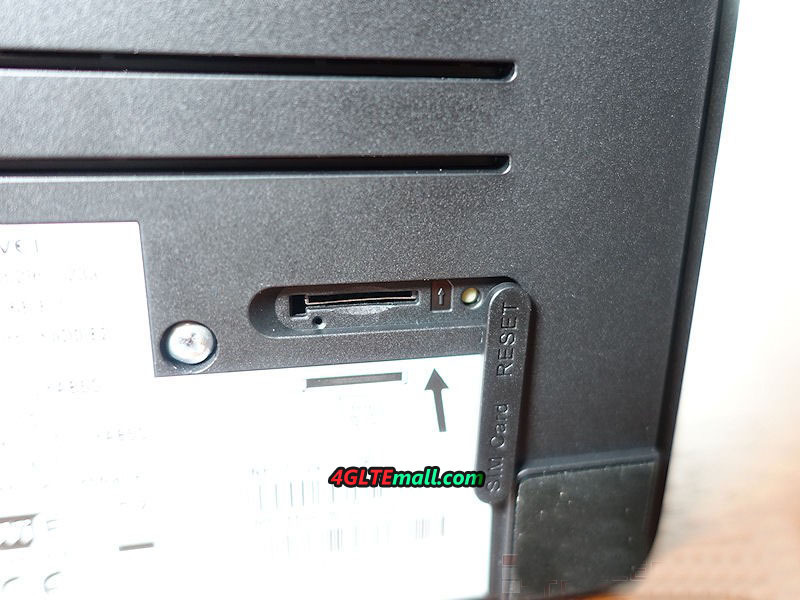 The integrated RJ45 LAN connection is a great advantage, and the connections for external antennas are good. The integrated battery is practical, but this only allows a short operating time and the Internet speed is throttled very much in battery mode. Nevertheless, those who are looking for a stationary LTE router with extra mobile use, Huawei B529s-23a and Telekom Speedbox are recommended.